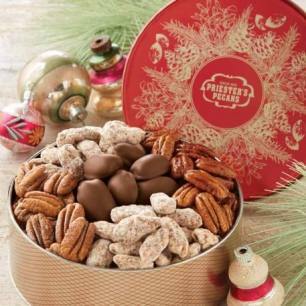 It's a pecan lover's dream come true. 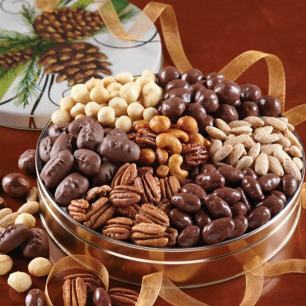 Seven pecan favorites including Milk Chocolate Covered Pecans, Praline Pecans, White Chocolate Covered Pecans, Key Lime Pecans, Honey Glazed Pecans, Frosted Pecans and Roasted & Salted Pecans are a welcome addition to office parties and family gatherings. 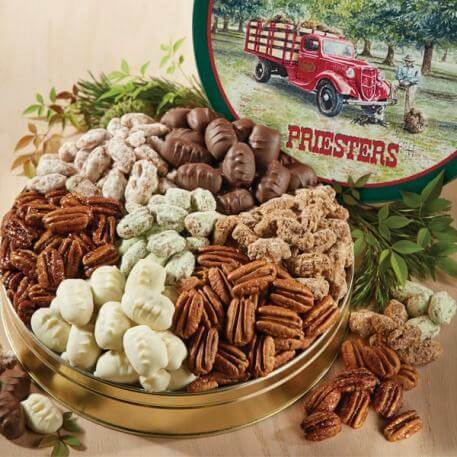 The assortment is packed in our Pecan Grove Tin. This was the perfect holiday gift to send to relatives living out of state. I picked a day for it to arrive at their home and it was delivered right on time! My aunt loved this gift. She enjoyed the variety of pecans. I got this for my Daddy for Christmas and he loved it.